What is the Beaverbrooks gift card? Can I use my Gift Card to purchase online? How will I know how much money is on my Gift Card? I haven’t spent the full value of my Gift Card, what will happen to the money? Is there an expiry period for my Gift Card? I have spent the money on my Gift Card, what should I do now? I’ve bought a Gift Card and want to return it for a refund, what should I do? My question hasn't been answered, what should I do? 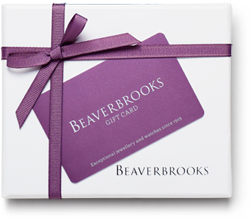 Our Beaverbrooks gift card looks just like a credit card and can be loaded with any amount you choose between £10 and £5000. It’s just like a gift voucher and will arrive perfectly packaged in its own presentation sleeve. Our Beaverbrooks Gift Card makes an ideal gift if you’re stuck for ideas and is perfect for treating someone special to a luxurious spending spree. You can choose to put anything between £10 up to £5000 on your gift card; the amount is totally up to you. Gift Cards can also be topped up in store with anything up to the maximum value limit. Let your imagination go wild, you can use your Gift Card to purchase any product online or in our UK stores. Treat yourself to something extra special. Yes, Gift Cards can be redeemed online. Simply enter the Gift Card number in the checkout to apply it to your order – you’ll also need the PIN number found on the reverse of the card. When you buy a Gift Card online we will send you a receipt showing the amount on the card and there is a space on the packaging for you to write the amount before you give it to that special someone. You can easily check your balance at any time by taking your Gift Card in to any one of our UK stores, or by using the online Gift Card Balance Checker. You can also contact our friendly Customer Service team free on 0800 169 2329 (Monday-Friday, 9am-5pm) who will be happy to check your balance for you. Don’t worry; the remaining balance will be saved on your card until you’ve found something else to treat yourself with from Beaverbrooks. Your Gift Card will be valid for 24 months following the last transaction date. Balance enquiries are not counted as transactions. Any balance remaining on your card will expire after 24 months. It’s up to you, you can dispose of it or you can top it up in any store with an amount between £10 and £5000. Why not use it to save for your next special purchase? Please take great care of your Gift Card and treat it as though it is cash. Unfortunately we cannot accept liability for lost, stolen or damaged Gift Cards. Contact our friendly Customer Service team free on 0800 169 2329 (Monday-Friday, 9am-5pm) who will be happy to help.